Maya Sullivan, LLC, 9780990754206, 346pp. 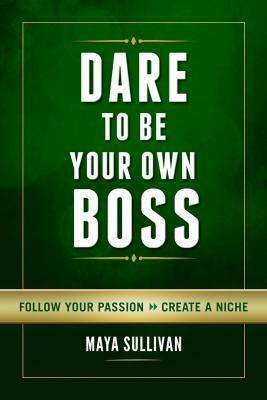 Dare To Be Your Own Boss empowers people to be their own boss by tapping into their vocational passion, exploring opportunities and creating a venture that resonates and is a good fit. It is an invaluable resource for individuals who are starting a business or making career choices. Step one involves tapping into what ignites one's enthusiasm using 14 keys to discover one's vocational passion. Passion increases the potential for success and can emotionally support a person through all kinds of hurdles. Step two is about identifying the type of people one feels impassioned to serve, looking at areas where there is a demand and then creating a niche. Step three involves combining enthusiasm and opportunities to identify ideas that resonate and are a good fit. Step four helps readers navigate the market research process to learn the potential viability of their chosen ventures. It involves looking at trends and kinds of businesses that could do well, even in weak economies, for well-managed enterprises. Step five is about moving forward and taking 50 action steps to make it happen. Being one's own boss can be empowering, stimulating and overwhelming at the same time. Yet people have an opportunity to use their values, strengths and passion to make a difference in their unique way and to be of service to others. About the Author: Maya Sullivan helps empower people to be their own boss through seminars, talks and startup consulting. She has an MBA and her career includes being an accounting and operations manager, financial analyst, stockbroker and entrepreneur. "Sullivan ... seeks to increase the odds of success in this in-depth informative guide. ... While Sullivan doesn't claim to have a roadmap to success, she does arm readers with knowledge that will be handy in getting there. " --BookLife by Publishers Weekly. This combination self-assessment and idea starter should spark the interest of anyone with entrepreneurial drive. Debut author Sullivan, herself an entrepreneur and small-business trainer, enters a crowded category but sets her work apart with its good intentions. Rather than supply the how-to advice commonly found in most be-your-own-boss books, Sullivan explores the motivational aspects of pursuing the entrepreneurial dream while also providing a wealth of business ideas. In the book’s first section, Sullivan offers such entries as “10 traits for entrepreneurial success,” “six benefits and six drawbacks” of being your own boss, and “14 keys to ignite your enthusiasm and passion.” Part 2 digs into the details of where an entrepreneur’s passion may lie. Here, Sullivan walks the reader through “12 areas of opportunity,” including both general and specific conceptual ideas. For example, the first two chapters in this section make a useful distinction between focusing on selling to consumers versus selling to businesses (B2B), while another chapter addresses selling to governments. Other areas key in on current trends that suggest possible areas of business opportunity: e.g., food and family farms, pets and companion animals, assisting seniors and people with disabilities, and “promoting a sustainable future.” A chapter entitled “Serving Needs of the Global Population” puts forth the concept of “social entrepreneurship.” The book’s final section concerns the entrepreneur’s assessment of the viability of a chosen idea. Here, Sullivan lays out a process for idea evaluation, offers helpful advice about how to do market research to determine an idea’s value, and provides an alphabetical listing of “50 Steps to Starting Your Business.” She includes a helpful multipurpose spreadsheet that can be used to rate areas of interest and ends with an extensive resources section. Sullivan applies a refreshing amount of altruism to her choice of categories that should give would-be entrepreneurs a sense of purpose as they consider what direction to take. Clearly and cogently written, a thought-provoking book that provides useful guidance to entrepreneurial risk takers as well as a treasure trove of potential business ideas. Many people dream about starting their own businesses and working for themselves, but few are confident enough to forgo a steady paycheck and leap into the unknown. Sullivan, a self-admitted serial career reinventor, seeks to increase the odds of success in this in-depth informative guide. The key, she states, is to discover what excites your passion and then match it with a venture. The book consists of three sections, namely “Becoming Your Own Boss,” “12 Areas of Opportunity,” and “Moving Forward.” Sullivan begins with the basics, identifying six benefits and six drawbacks of being the boss, with expanded income potential and enhanced well-being on the upside, and financial uncertainty and no subsidized benefits on the downside. She also explores options for financing that range from traditional investors to crowdfunding. Sullivan goes on to list “14 Keys to Ignite Your Passion and Enthusiasm.” Part Two focuses on categories of industries to explore, such as business-to-business, and goods and services. The last section is perhaps the most crucial, exploring the all-important concept of viability, followed by a lengthy list of resources for new business owners. While Sullivan doesn’t claim to have a roadmap to success, she does arm readers with knowledge that will be handy in getting there.